I clean skulls, complete skeletons, or anything in between. So far, no specimen has proved to be too large or too small for the beetles and I to work with (I challenge you to be the first!). The start-to-finish process includes cleaning, degreasing and whitening of the skull, as well as polishing of horns or antlers. The average turnaround is six months. Specimens should come in fresh or frozen, with no flies or maggots. Maggoty, rotten, creepy/crawly specimens are subject to a $25 “biohazard” fee. But don’t worry if you’ve got a mess on your hands – you’re still welcome to bring it in. I’ve probably seen worse! For skull cleaning prices, click here. A coating of real metal over bone transforms your skull into a unique work of art, preserving and enhancing an incredible level of detail. 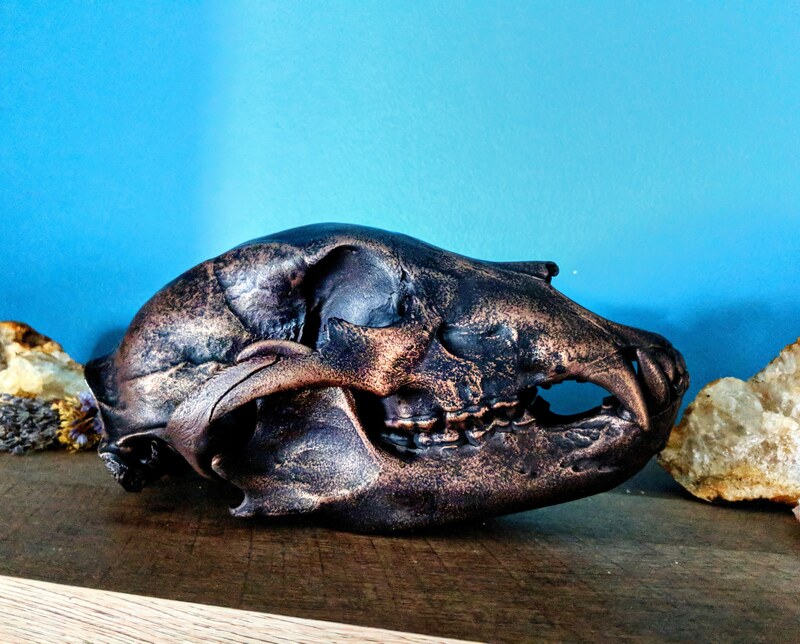 While any bone looks beautiful like this, it is an especially good option for skulls that are cracked or brittle – the metal coating will seal the skull and provide substantial protection. This can also be done to antlers and horn. A variety of chemical patinas can be applied to the metal for an antiqued, aged effect. 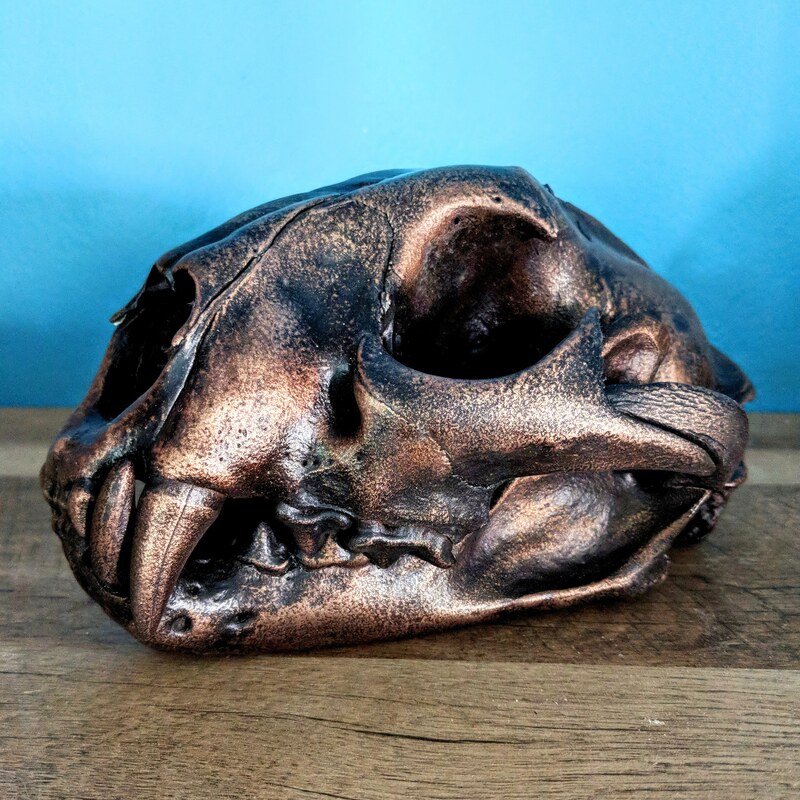 The whole process is done in-house, and each piece is polished by hand with steel wool to highlight detail and bring out shine before being sealed with a UV/weather resistant clear coat that protects the skull and prevents unwanted patinas from developing over time. At the moment bronze is the only metal coating offered, though I expect to add more options very soon. Customers that combine skull cleaning services with metal coating receive 30% off the cost of cleaning. For metalizing prices, click here. 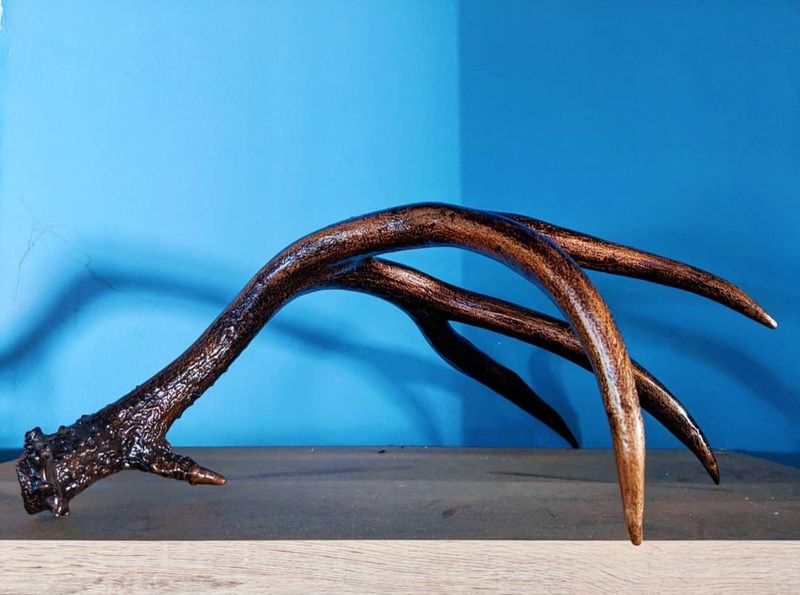 Things happen – sometimes bone, horns, or antlers end up discolored, broken or otherwise damaged. I’m here to help. Each repair or restoration project is unique, and starts with a free consultation to determine the scope of my services. I will do my best to be honest with what I can accomplish, and in some cases may turn down projects if my process may make the situation worse or I don’t feel I can help. 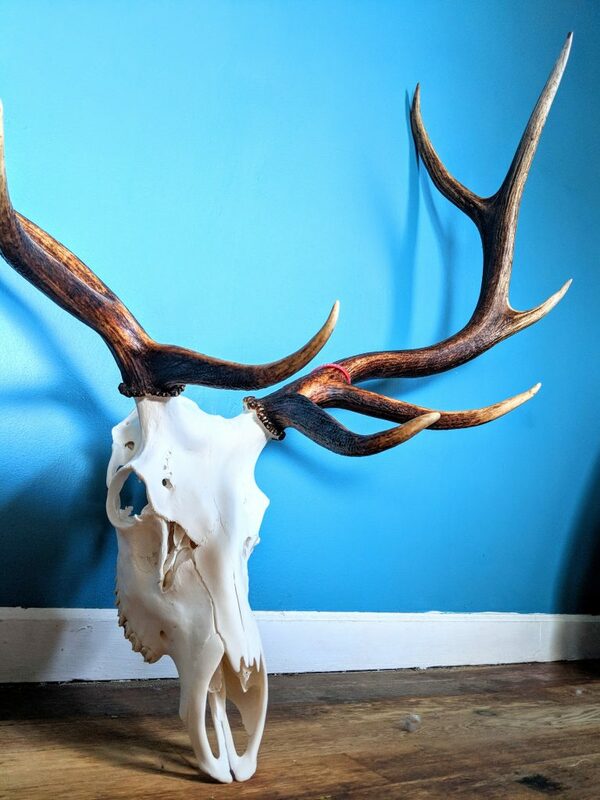 Some common examples of the repair / restoration work I get in: whitening discolored or greasy skulls, paint/glue removal, patching bullet holes, preventing further damage to flaky/brittle skulls with museum grade consolidant, rebuilding antlers, horns or bones that have been severely damaged. I see myself as a partner in the success of my taxidermist clients. My wholesale services are a way for you to provide top quality Euro mounts to your clients while freeing up time and shop space for your true art. Understandably, many shops are hesitant to have beetle colonies as they can be devastating to your taxidermy mounts if they find their way to them (and they are escape artists), but beetle cleaning is in high demand. My wholesale services are contract-free and you are welcome to use them on an as-needed basis. Some shops may just need some extra help during busy times when space gets tight, or may want a reliable partner in outsourcing all of their skull cleaning needs. I also offer taxidermy rugging services on a limited basis. Rugging services include: stretching, flank dyeing, double pleated border of high quality wool-blend felt, padding, lint-free rugged backing fabric, D-rings for hanging. 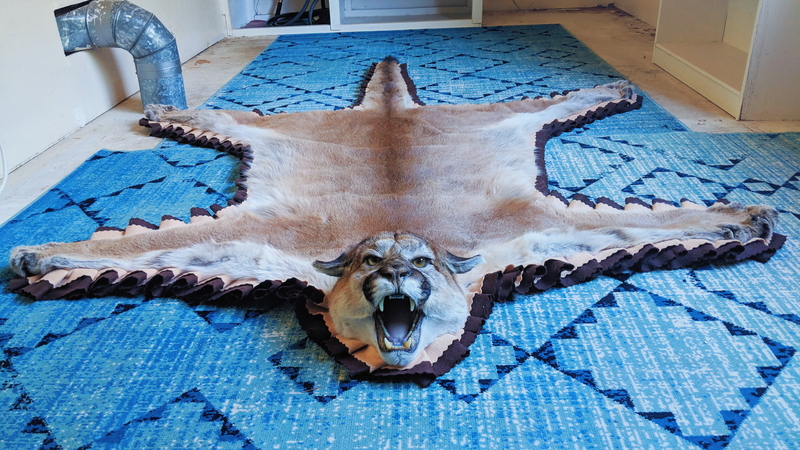 Rugs are machine and hand sewn. 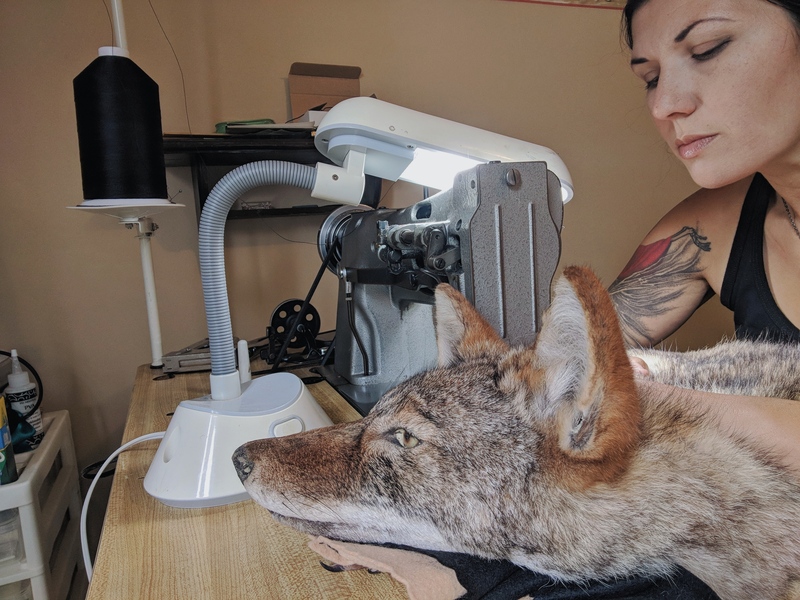 Tanning, headshell mounting and finish work are the responsibility of the taxidermist. Pickup and drop-off to your door is complimentary for shops within 20 miles of Dallas, Oregon, and available for a fee for longer distances in the Portland metro area. Please email me – carla@dermestidarium.com – to introduce yourself and request a wholesale rate sheet.